Original VHS releases 'going' DVD is - generally speaking - good news. The old dudes re-see what they've long forgotten they had on analogue video format, while the new generation grabs the chance to see some beloved bands onstage in past times. While waiting for a new KREATOR studio release, sometime in the near future, the At The Pulse Of Kapitulation: Live In East Berlin 1990 DVD/CD package serves as a good reason for the German thrashers' followers to add a remarkable piece to their collection. I do not 'fight' for the KREATOR name that much anymore. I loved their 'attack' days, I valued their 'pro Thrash' evolution 'till the early 90s, I felt betrayed with the Renewal CD and - from then onwards - I kinda feel divided with every CD they do make. But I buy all of them, due to respect. Respect for the loyalty of the Mille/Ventor due to the Metal principals, respect for their accuracy in writing well-worked songs, respect for their decision to 'let the music do the talking', not falling into the ultra-promotion/gossip label/Media trap overlapping the scope. And, for this, thousands of fans across the globe have showed endless faith, bowing to the Essen act's we-do-it-cause-we-want-it attitude. Act I: The gig at East Berlin (at the Werner Seelenbinder Halle) occurred as a result of the Extreme Aggressions Tour. Hence, the setlist performed herein may be considered by many old-school aficionados as a dream-come-true one. Overlapping the nostalgia of those days and the staring at the 'hell's breaking loose' crowd, it would be essential to state that this is not an over-the-top KREATOR performance, since Ventor's playing 'shakes' at times (like one specific camera in the venue, haha!!) while Mile's vocals sound damaged here and there. But, in general, the (rest of the) instrumentation and general appetite for destruction of the band is more than obvious, contradicting vividly with the hungry crowd (East Berlin…1990…the Wall…got the picture?). Headbanging & 'sofa diving' are guaranteed, in other words (remember to buy another neck for Tormentor…again). The sound - non-exciting in the original VHS I possess - is now top-class, and Niels Folta and Mille digitalized it while Andy Sneap done the 5.1 mixing sound. Good job, sirs. Anxious if the result is 'polished'? Hell, no; can you clean up 'dirty diamonds' like Under The Guillotine, Riot Of Violence and Awakening Of The Gods? 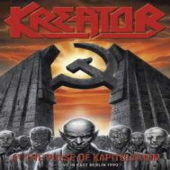 Especially these 1985-1987 cuts - KREATOR was often criticized back then as a 'should-exercise-more-often' Thrash band (and they did) - are now performed more accurately, without omitting their savageness. For fans of the pre-Renewal days of KREATOR, you should expect you'll be 'touched' by what you'll witness (and draw your own conclusions for KREATOR to-date). Act II: The Past And Now is a 'bonus' 17-minute documentary featuring footage from that day (the whole event also included TANKARD, SABBAT and CORONER) with fans, organizers and security guards speaking. In addition, journalists remembering that day in front of the camera and - among various statements - it would be astonishingly 'weird' to hear/see the difficulties metalheads had in (former) East Germany feeding their metallic hunger. For the 'early days' fans, this can act as the most 'sloppy' reason to purchase this DVD/CD release. Act III: Hallucinative Comas was a rare piece of VHS tape to be obtained, I can recall. Filmed as a kinda short-time movie in 1991, it features a naive scenario adhesive to a set of 4 songs off KREATOR's Coma Of Souls 1990 release. Nothing explicit, in my humble opinion (even if those days it was rare enough to see such a VHS 'action'; live performances left aside…), but surely a good addition to this combo since the original piece turned out to be rather infrequent. The reason for not putting so much passion to this review is merely due to my sceptics towards the new Metal generation. Having (free, if they want) Metal music all around at 'one touch', I don't know if they'll 'get' the picture of what went on back then in some countries, when you were happy enough having money to afford just one LP or paying for photographed(!) Metal mags' articles; not to even mention a band visiting your area for a gig. A more 'detached' aspect may touch better easy-come-easy-go metallic minds. And then, if you wonder …what's this Awakening Of The Gods track… or why this non-faultless gig was out on video anyway…well, you just miss the 'big' pic. And - funny thing being - you (kinda) deserve it.